We decided to send our actual postcards with the link to our blog where we could share some fun facts about our state easily (no hand cramps this way). Welcome to all the postcard swap participants! And local readers should feel free to add any of your own favorite Wisconsin facts in the comments too. The first practical typewriter was designed in Milwaukee in 1867. The nation's first kindergarten was established in Watertown in 1856. The first Ringling Brothers Circus was staged in Baraboo in 1884. -Noah's Ark in Wisconsin Dells is the nation's largest water-themed park. -Bloomer is the Jump Rope Capital of the World. -Two Rivers is the home of the ice cream sundae. -The original Barbie (a doll manufactured my Mattel, Inc.) is from Willows. Barbie's full name is Barbie Millicent Roberts. -Milwaukee's Summerfest is the nation's largest music festival. -The EAA Fly-In brings 12,000 planes to Oshkosh each year, making it the busiest airport in the world. -Milwaukee is home of Harley Davidson Motorcycles. 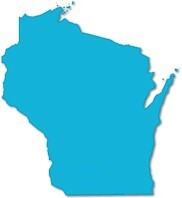 Other Wisconsin companies are: Miller Brewery, SC Johnson, Jelly Belly, Kohl's, GE Medical, Oscar Mayer, Masterlock and Mercury Marine. -The highest temperature ever recorded in the state was in the Wisconsin Dells, on July 13, 1936, at 114 °F. The lowest temperature ever recorded was in Couderay, where it reached –55 °F on both February 2 & 4, 1996. Milwaukee is also home to the world's largest 4 sided clock -- the Allen Bradley Clock tower!